Nigeria and other countries across the world are expected to spend over US$811 billion on 615 upcoming oil and gas fields between 2018 and 2025, GlobalData, has revealed. Nigeria, Mozambique, Australia, Canada, Norway, Indonesia, and the UK, together have a total of $298 billion, averaging about 37 percent of the total spending on the projects globally. 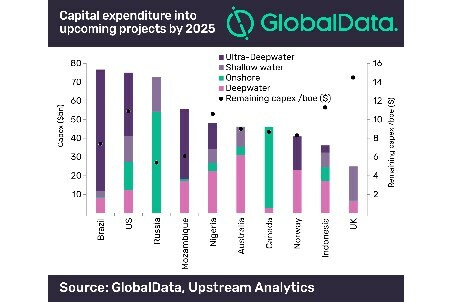 According to the GlobalData, a leading data and analytics company, capital expenditure (CapEx) into conventional oil, heavy oil, oil sands and unconventional oil projects would add up to US$352 billion, US$44 billion, US$43.4 billion and US$30 billion respectively over the eight-year period. Nigeria’s federal government had earlier said the country would increase investments in the oil and gas sector to add over $100 billion in the next five years. Ibe Kachikwu, the country’s minister of State for petroleum resources, had said that recent investments in the sector is about $40 billion but stated at a forum recently that the country would be able to boost investment in the nation’s oil and gas sector to record $100 billion in the next five years. “The investment will be targeted at gas, gas infrastructure, replacement of existing dilapidated pipelines, which will be carried out by private sector investments,” he added. Collectively, the oil and gas industry across the world would spend $352 billion on conventional oil, heavy oil is expected to stand at $44 billion, while oil sands take about $43.4 billion, and unconventional oil takes $30 billion over the eight-year period. The report noted that conventional gas projects would cost about $363.2 billion, while the investments into coal bed methane and unconventional gas projects would cost a total of $3.7 billion and upstream expenditure was expected at $1.6 billion. Brazil alone accounts for $76.7 billion, an average of 9.5 percent of total spending, while the projects include 49 announced and planned fields. The U.S. has about $75 billion of the expenditure, averaging about 9.3 percent share in the global planned and announced projects over the forecast period. The report also revealed that the U.S. has 37 planned and announced fields, including ultra-deepwater Mad Dog Phase 2, shallow-water Smith Bay and onshore Horseshoe. Russia is expected to contribute $72.6 billion or around nine percent to the total capital expenditure. According to the report, the projects will require $1705 billion in to produce over 88 billion barrels of crude and 877 448 billion ft3 of gas.